The AR Emojis supported by Samsung's current top-end smartphones, the Galaxy S9 and S9+, just received an update. It adds six characters from the upcoming "Incredibles 2" animated film. Mr. Incredible, Elastigirl, Violet, Dash, Jack-Jack and Frozone are all part of the Incredibles family and can be downloaded from the Galaxy App Store to brighten up your day. 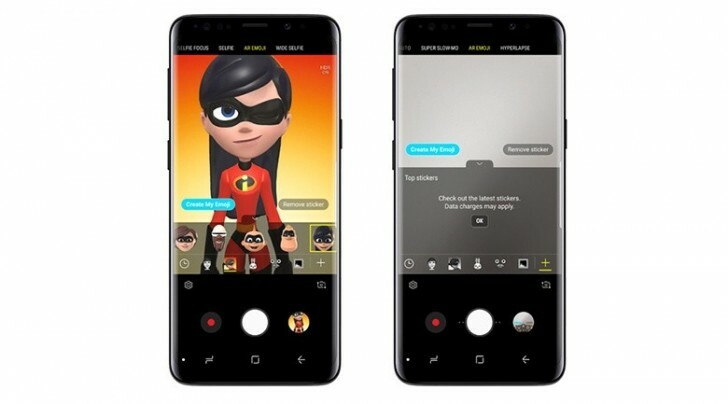 Just open up the AR Emoji camera menu, tap on the plus icon and download the Incredibles AR Emoji pack. You can check the previous releases like Mickey, Minnie Mouse and Donald Duck or you can wait for the Zootopia and Frozen if you are a fan of those. They should be available for download pretty soon too. Yes, that's true. I wasn't specifically talking about Incredibles though. Why not animoji from Poetin, Trump, real animals, real baby, fruit (apple/orange).